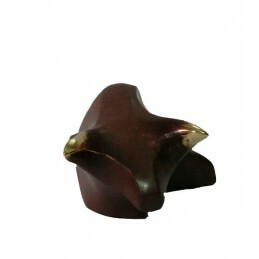 Bullfight sculpture There are 7 products. Beautiful pieces of bullfight sculpture in bronze and aluminum by sculptor Pedro de Andres representing the bullfighter, the bull, the passes… At ZiNGS you will find bullfight sculpture made in Spain. Pedro de Andres was born in Madrid in 1956. A self taught artist, he grew up immersed in the plastic arts in his family’s artisanal workshop. There he came into contact with some of the greatest sculptors of that time under whose tutelage he learned techniques and perseverance. During his long artistic career he has demonstrated his capacity for creating emotions through his art and his sculptures are reflections of the different stages of his life. Bull horns bronze sculpture called "Astas" Spanish author Pedro de Andrés. Available in two sizes, these sculptures are the perfect gift for bullfighting art collectors.Measures: 1.8'' x 2'' (big) and 1.4'' cm x 1.6'' (small)Gift box presented with the certificate of authenticity signed by the author. Aluminum sculpture well known Spanish sculptor Pedro de Andrés, who presents this figure "Lucero" bull. Beautiful detail to decorate, for promotional gift or bullfighting art collectors.Measures: 3.1'' x 1.6''Is presented in a gift box with the certificate of authenticity signed by the author. Bronze sculpture named "Soñador" (Dreamer) by well known Spanish sculptor Pedro de Andrés. The figure of the bull dreamer in bronze is a detail to decorate, for promotional gift and collectors.Measures: 2.7'' x 1.4''Is presented in a burgundy gift box with the certificate of authenticity signed by the author. Aluminum sculpture "Astas" by Spanish artist Pedro de Andrés. 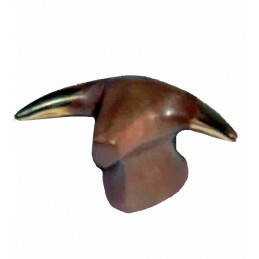 This bull horns figure is ideal for decorating as promotional gift and/or bullfighting art collectors.Measures: 1.8'' x 2'' (big) and 1.4'' x 1.6'' (small) A gift box presented with the certificate of authenticity signed by the author. Sculpture of a bull in aluminum, from the well-known sculptor Pedro de Andrés named by the author as "Embiste". The collection of figures by this artist are great for decoration or as prizes in bullfighting contests clubs and schools.Measures: 2.7'' x 1.4''Presented in a gift box with the certificate of authenticity signed by the author. Aluminum sculpture called "Torero" from the Spanish sculptor Pedro de Andrés, this figure of the bullfighter is a detail to decorate, or as a promotional gift. Made in Spain.Measures: 2.1'' x 3.7'' x 1.2'A gift box presented with the certificate of authenticity signed by the author. Aluminum sculpture by Spanish artist Pedro de Andrés, a tribute to the bullfighters called "Maestro" (master). This figure of the fighter with cape in hand is a great detail to decorate, promotional gift os for taurine art collectors.Measures: 2.3'' x 3.9''A gift box presented with the certificate of authenticity signed by the author.